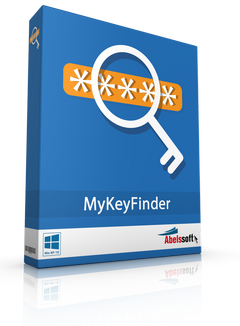 Abelssoft MyKeyFinder Plus 2018 is a tool dedicated to retrieving lost or forgotten serial numbers to various software products, including Microsoft Office and Windows. It comes packed with an intuitive set of options that can handled by all types of users, even the ones with limited experience in such programs. Setting up the app takes little time and minimum effort. However, it is required to enter an email address to register MyKeyFinder for free. Scanning the computer for serial keys may take a while. The list of results shows the app name, registry key and serial number. Separate entries can be copied to the Clipboard for closer scrutiny and safekeeping. It is also possible to print selected entries as well as to export them to PDF format. A search function is available for dealing with large amounts of data. As far as program settings are concerned, you can switch to another language for the UI, set MyKeyFinder to automatically check for updates at startup and to confirm ignoring operations for an item, as well as to create a white list or black list. 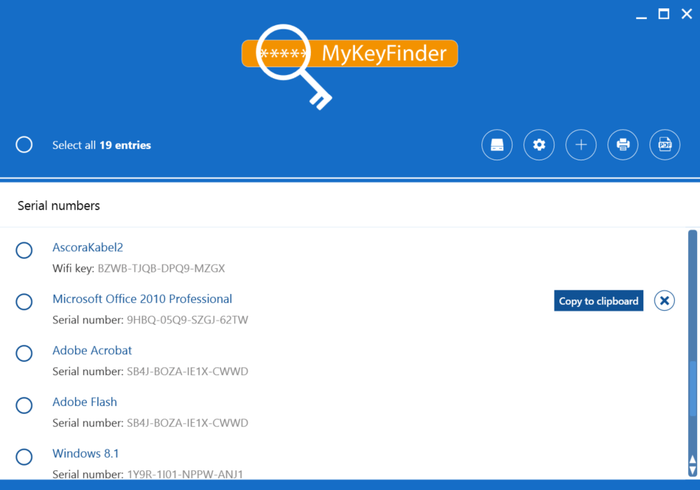 MyKeyFinder has a good response time and runs on a low quantity of CPU and RAM, so it does not concern the computer's overall performance. It can be minimized to the taskbar to become non-intrusive. We have not come across any issues throughout our evaluation, since MyKeyFinder did not hang, crash or pop up error dialogs. Thanks to its intuitive layout and overall simplicity, it can be handled by all user levels.